Each cuff features embossed lines, streets, and numbers of notorious subway systems around the world. Great gift for my daughter who was living in NYC at the time. Well made and easy to read. Great bracelet and amazing customer service. Amazing customer service. They quickly replaced the bracelet with a different one and was very prompt and accommodating. This cuff is just a treasure. I chose Paris to honor the victims. It is beautifully made and fits great! 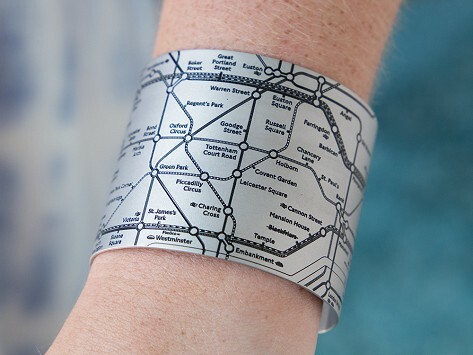 With cuff bracelets or a necklace from Designhype, you can wear a subway map of your favorite city right on your sleeve or keep a landmark that has special meaning for you close to your heart. Company founder Tiffany Burnette brings her love of travel to each city-centric piece of stainless steel jewelry she creates. The Metro series cuffs turn subway systems into statement pieces that double as a handy guide for tourists and locals alike. The subway lines, numbers, and streets are embossed into the surface. With a quick inconspicuous look at your wrist, you’ll find your way in no time. Inspired by famous buildings and monuments, the Reflect necklaces are an everyday reminder of memorable places in your life. With Designhype, you don’t have to book a plane ticket to show your appreciation for cities and landmarks near and far.